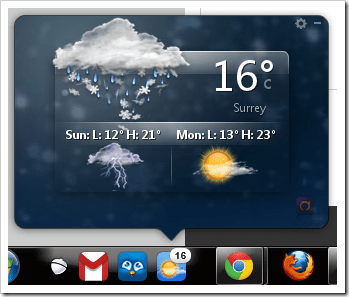 Pokki is a simple, sleek, useful Windows app that allows you to pin Web Apps onto the Windows 7 taskbar. 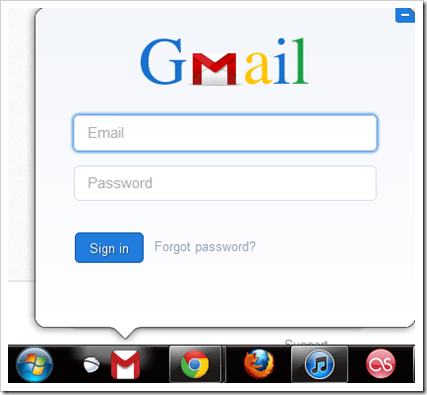 With a single click you can get access to your twitter feed, checking Gmail including reply, search and compose emails without even going to a web browser. 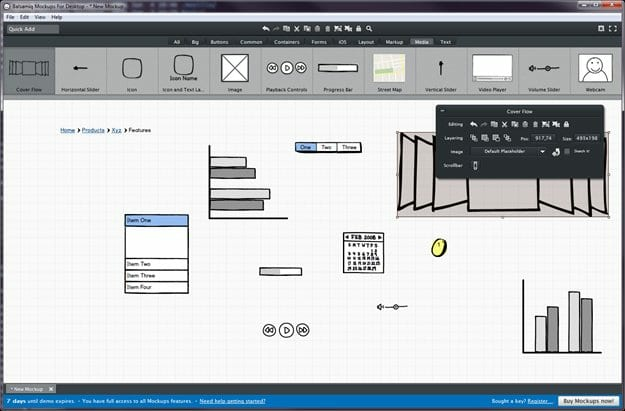 Pokki is a frame work that allows web developer to port their web app into desktop app without re-writing their application specifically for desktops. 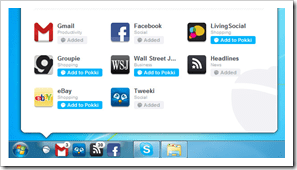 Pokki also bought mobile smartphone apps concept onto Windows desktop, with real time notifications, one click lunch, add and remove apps. 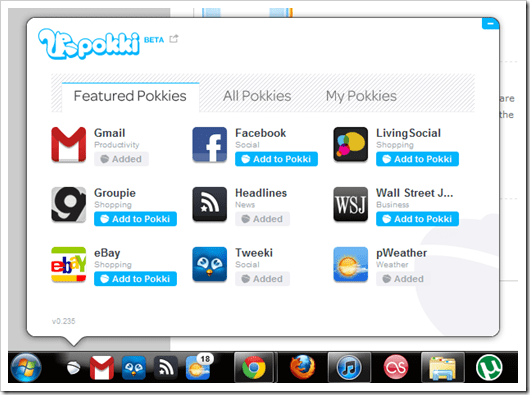 The best of all is some of the app Pokki has is actually very useful with great user experience. 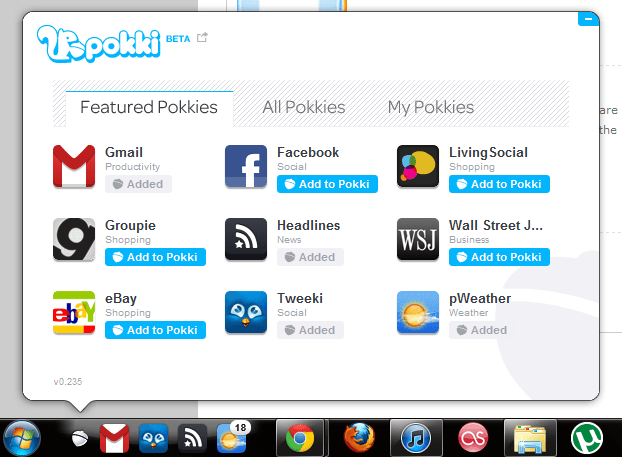 You need to download one of the app listed on Pokki’s homepage take Gmail as an example. Click the download link for Gmail, then it will ask you for promising to run a Java run time, click either of the choice to proceed. 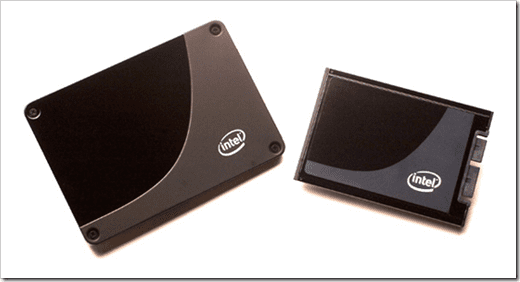 Click Continue, then you should be able to see two icons now newly being added to your Windows 7 dock. 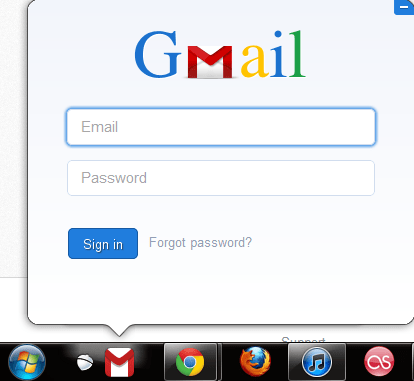 The first icon is the Pokki’s app store, the second is your newly Gmail app waiting for sign in. For now there aren’t many selections from Pokki’s web app store, but with the limited Apps selections they do offer some great apps. Believe it or not, they some of them especially the Tweeki app for Twitter is exactly what Windows user has been missing for a Windows twitter client. 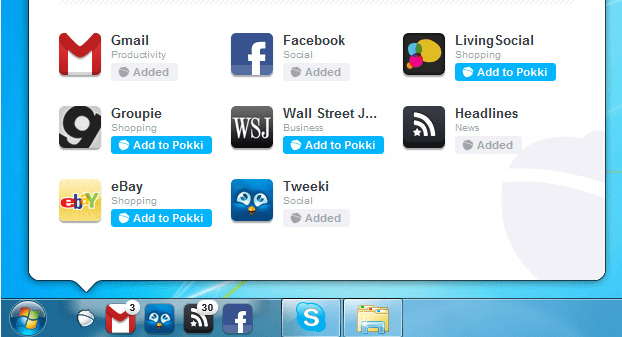 Speaking of the Tweeki for Twitter, all you need to do is click “Add to Pokki” from the Pokki app selection tab or from the website. 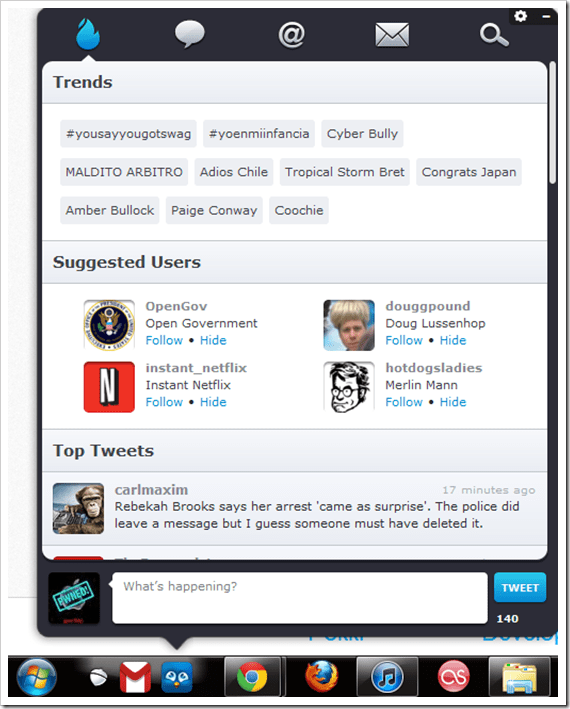 Once you done and Authenticate your twitter account, you will see this clean and well designed UI with some of the basic features to start browse your tweets. 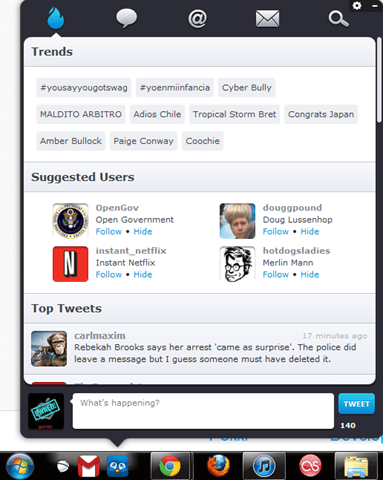 For now it doesn’t have support for List, profile viewing, and image preview features. 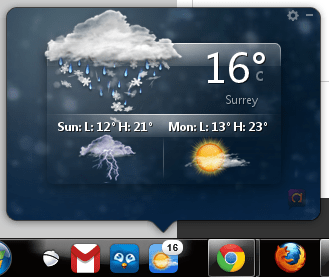 The weather widget is also simple and elegant, displays the temperature with a nice touch that also dynamically displays the current weather and temperature as a notifications on the Windows 7 dock. 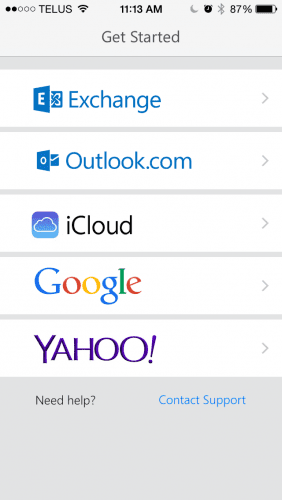 Pokki had a great idea, and have certainly executed well with some of it’s notifications systems and UI layouts. For now it’s still in beta but it certainly have lots of rooms to grow. 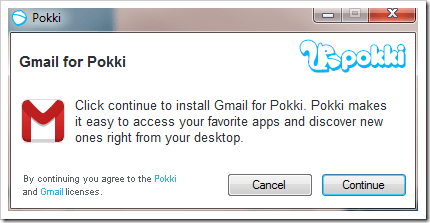 If you like to find new ways to be more productive on your daily routings dealing with computers, you have to give Pokki a try now.